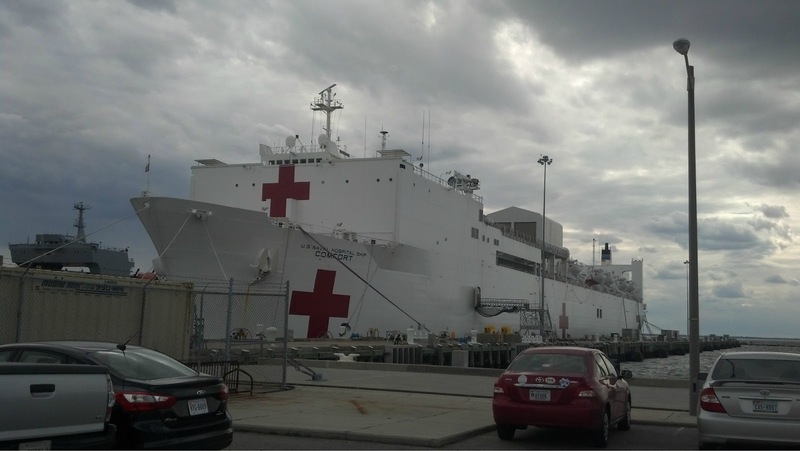 On Wednesday I had a meeting for work on the Naval Base in Norfolk, VA. At the end of our meeting we had the opportunity to tour the USNS Comfort, one of the U.S. Navy’s hospital ships. It has been used to provide relief after disasters such as Haiti, and also provides on-site emergency care for U.S. combatants in a time of war. It has been deployed during Operation Desert Storm, as well as to New York during the terrorist attacks in 2001. 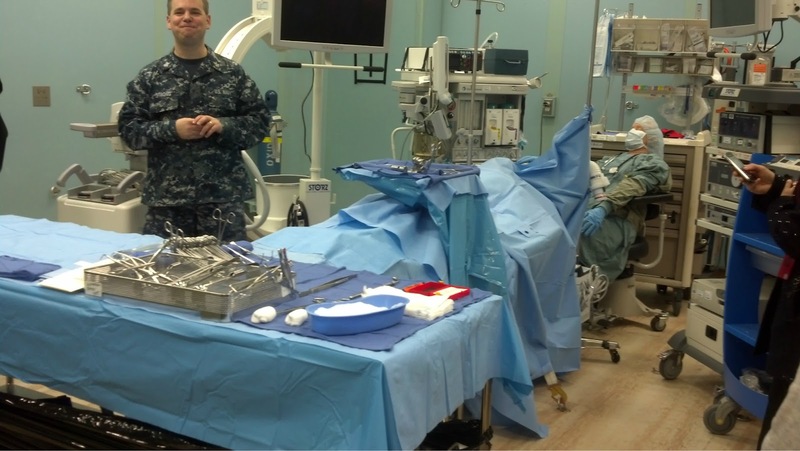 It has also served as an afloat trauma center in the Persian Gulf during Operation Iraqi Freedom. 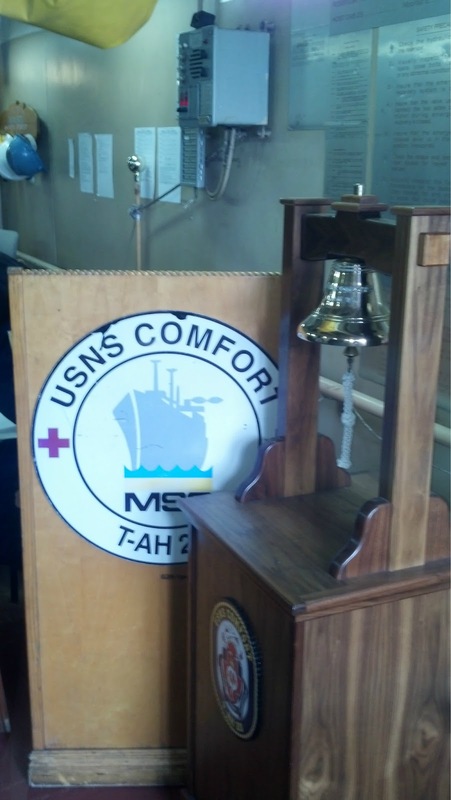 The Comfort has also been used for missions, including three Continuing Promise missions in 2007, 2009, and 2011. Continuing Promise is a humanitarian civic assistance mission that has mainly served the Central America region. This involves providing medical and dental care, both on and off the Comfort, including surgeries that take place on board the ship. It also provides civil assistance (including public health training, veterinary services, and engineering education) to the host nations visited during the mission. This is the helicopter control tower. The Comfort has a flight deck that can handle the world’s largest military helicopters. The Continuing Promise missions demonstrate the Navy’s ability to be a global force for good, while building relationships with host nations and the non-governmental organizations that assist with the mission. The ship itself is operated by Merchant Marines. The medical folks on board are made up of Naval medical personnel who work side-by-side with civilians from non-governmental organizations (Johns Hopkins, Project Hope, Samaritan’s Feet, World Vets, Operation Smile, etc.). Most of the parts of the ship we toured resembled a traditional hospital. However, there were other parts that very much reminded you that you were on board a ship. 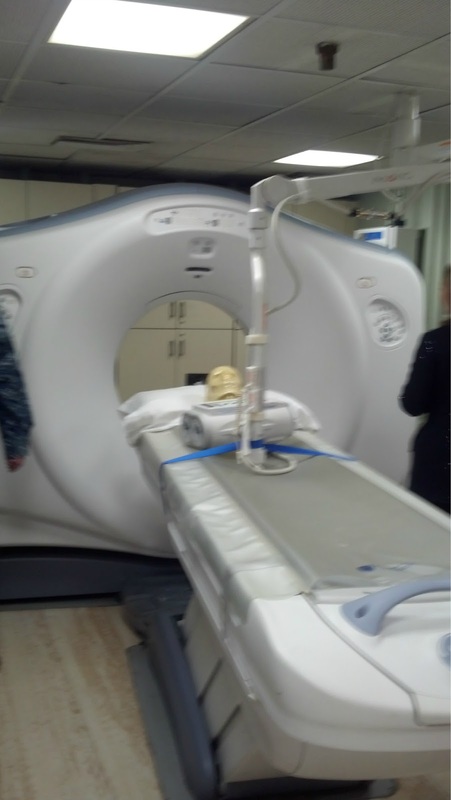 For example, this is the CT machine that they use to evaluate patients. Looks pretty much like a normal hospital, right? It mostly did, except for the straps here and there to hold equipment down and in place while the ship is moving. The surgical area also looked very much like a hospital. If you look closely under the instrument table, you will notice a notch on the floor. This is where they can chain equipment (such as beds, tables, etc.) that are on wheels to the floor to keep them from moving during travel. That’s one of the subtle differences that reminded you that you were on a ship. They also had a minor surgery area, where up to 12 surgeries can take place simultaneously. And then there’s the pediatric ward, which I thought looked much more like sleeping quarters than a ward in a hospital. 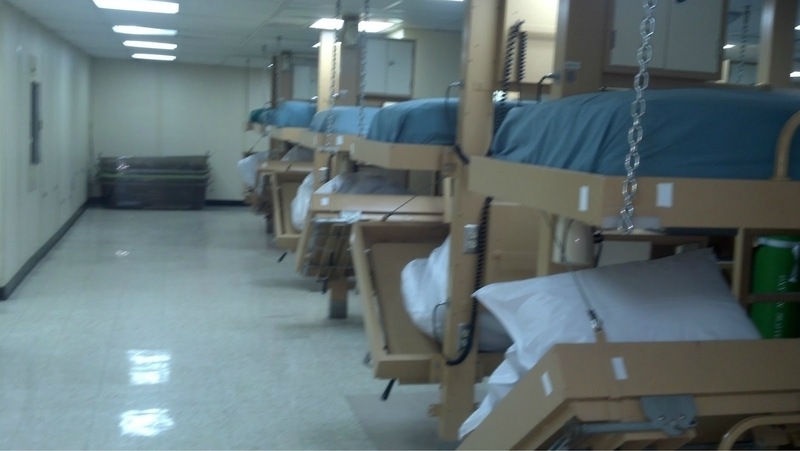 They’re set up like bunk beds, and there were over 300 beds in this ward. Less critical patients use a ladder to get to the top bunks. There were spots for IV bags to be hung and nurse call buttons. 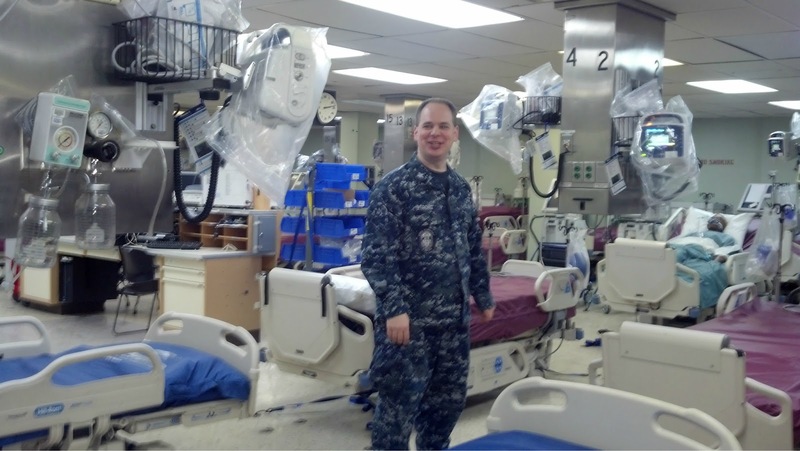 The ship also included a very large ICU, complete with beds equipped with air mattresses to help prevent bed sores (when the skin breaks down from patients laying in one spot with pressure on a particular area). The beds also alarmed if the patient tried to get out of bed. When the ship responded to the disaster in Haiti, they had a special “quiet” section of the ICU sectioned off where patients who had lost limbs woke up from surgery. 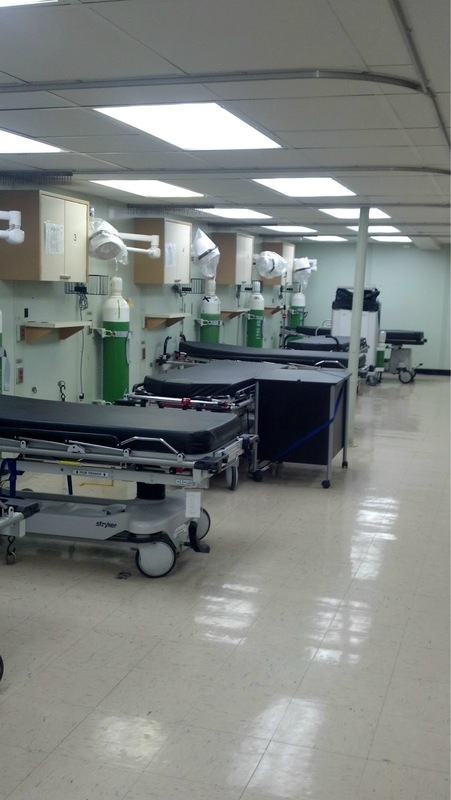 Other areas outside of the hospital portion look more like a typical ship. 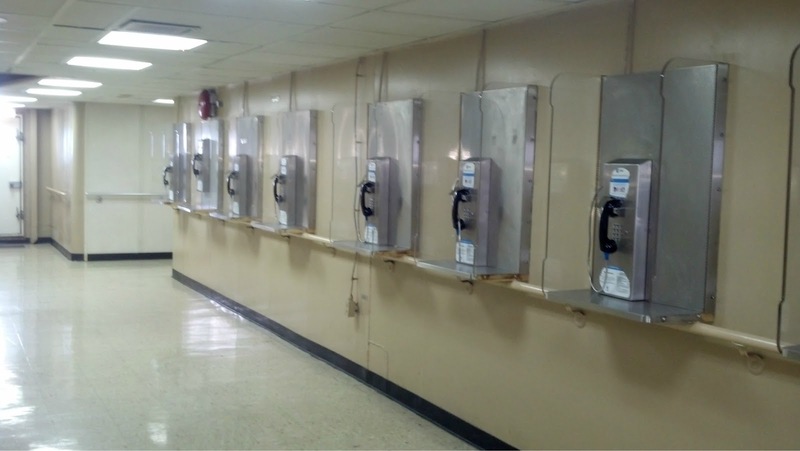 This wall of payphones is where members of the crew can call home. However, it costs $2 to connect and then $0.45/minute after that. The ship also has internet capabilities, although it cannot support the bandwidth for crew to use Skype. But it does allow members of the crew to be able to send emails home. We were unable to tour the galley or berthing areas (living quarters) because there are currently Naval personnel and Merchant Marines who live and work on the ship. The ship is 894 feet long, and 106 feet wide. It fits through the Panama Canal by one foot! It has a max speed of 17.5 knots (about 20 mph). USNS Comfort transits the Panama Canal during CP 2011. 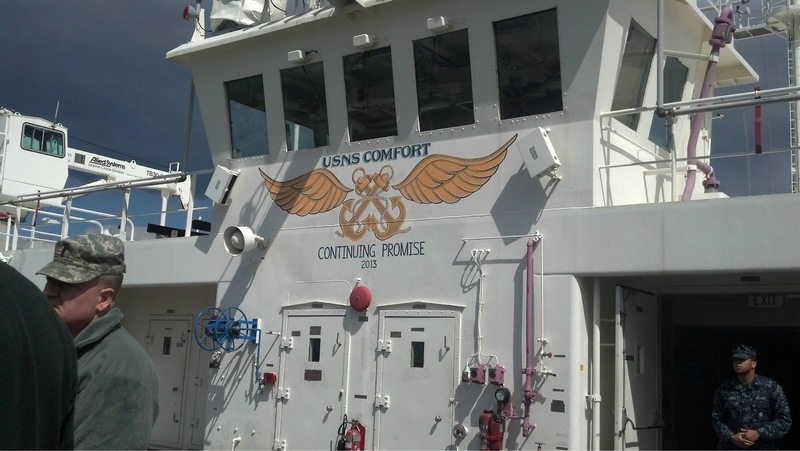 The USNS Comfort was set to deploy for Continuing Promise 2013, but that was recently canceled due to budget limitations imposed by sequestration. However, you can still check out the Continuing Promise Facebook page to see pictures from past missions. In 2011 they visited Colombia, Costa Rica, Ecuador, El Salvador, Guatemala, Haiti, Jamaica, Nicaragua, and Peru. Very cool!!! Thanks for sharing!! Thanks, I thought so, too! I agree. It’s really neat to get to learn about and see new stuff like that. I had no idea the U.S. had a ship like this. Thanks for the information. 🙂 I can’t imagine navigating a ship that size with only ONE FOOT of breathing room! Wow that is so cool!! I can’t believe they can do all of that on a ship. Also, I can’t imagine going through the Panama Canal with that close of a margin–yikes!! I know! 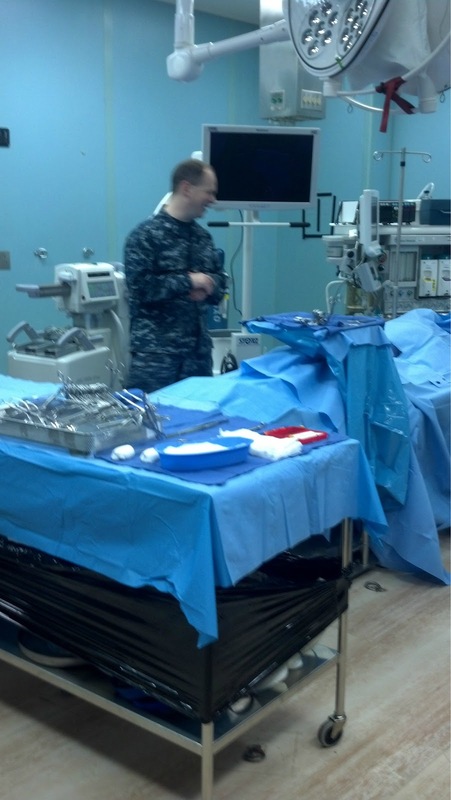 I thought it was so cool that they were able to do so many surgeries and stuff on board! In addition to the CT machine they also had X-ray machines and an angiogram (I think that’s what it was called). They also have two portable X-ray machines they can take on land. That’s really cool! I’m so glad you shared it with us!